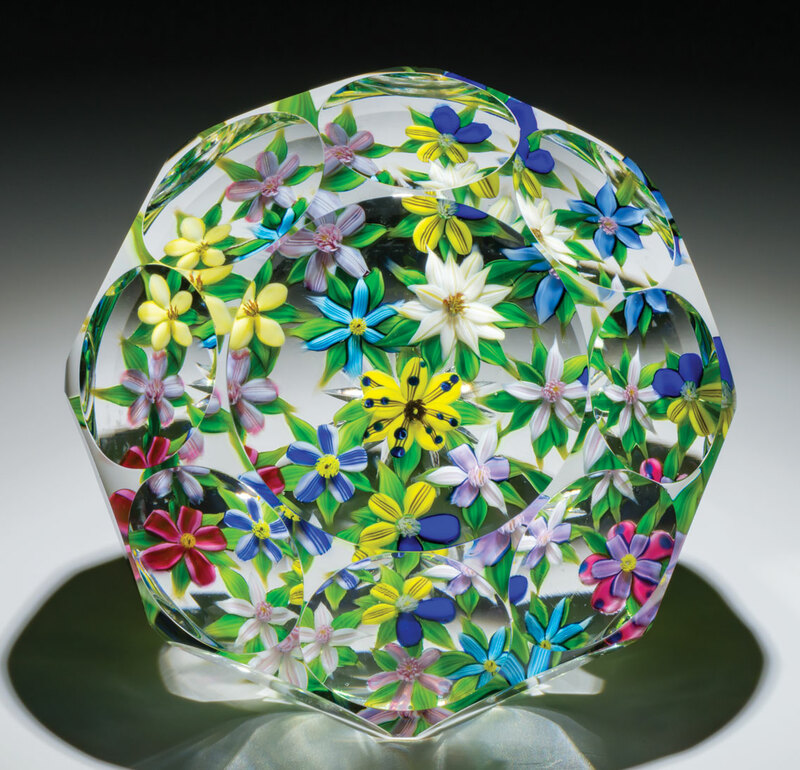 On May 17, 2019, the Paperweight Collectors Association (PCA) will visit the FIA as part of their biannual conference, happening this year in Dearborn, Michigan. 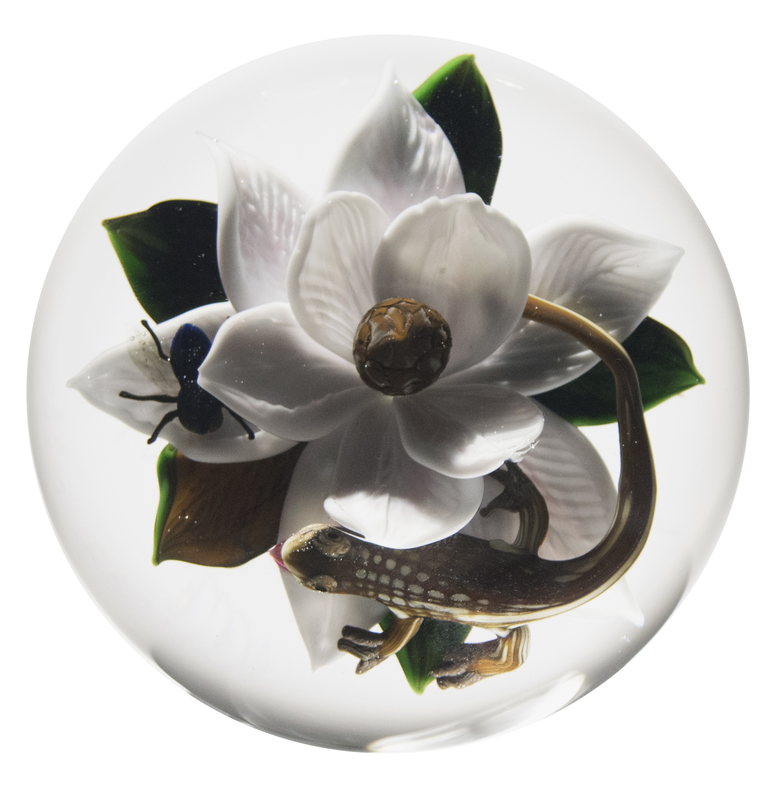 The PCA is a non-profit organization dedicated to appreciating and collecting glass paperweights. Their mission is to promote education by increasing knowledge about paperweights, their creators, and the astounding glass medium from which they are created. FIA Curator of Collections and Exhibitions Tracee Glab will be the keynote speaker during the conference. During their time at the FIA, they will tour the Small Worlds exhibition and view demonstrations in the FIA Hot Shop and Flameworking Studio. During the planning stages of the conference, contemporary paperweight artist Cathy Richardson visited the FIA to see its facilities. 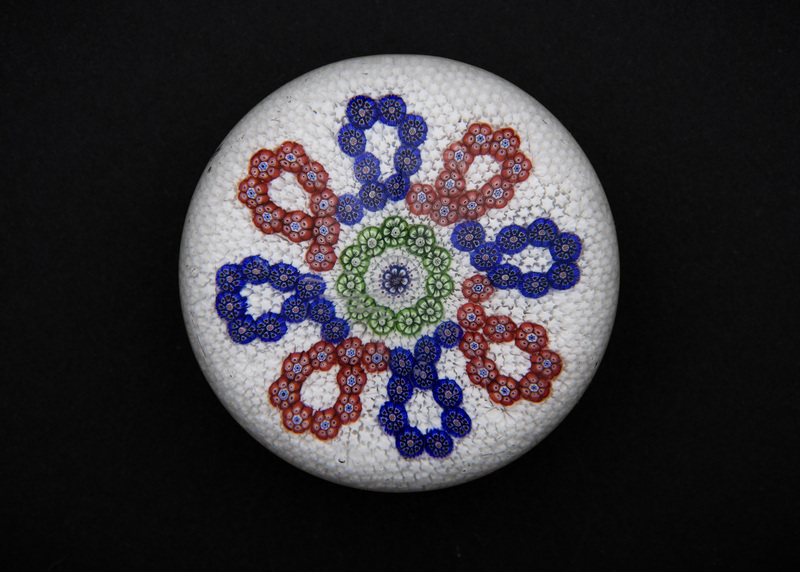 This trip inspired her to donate one of her paperweights to the museum. 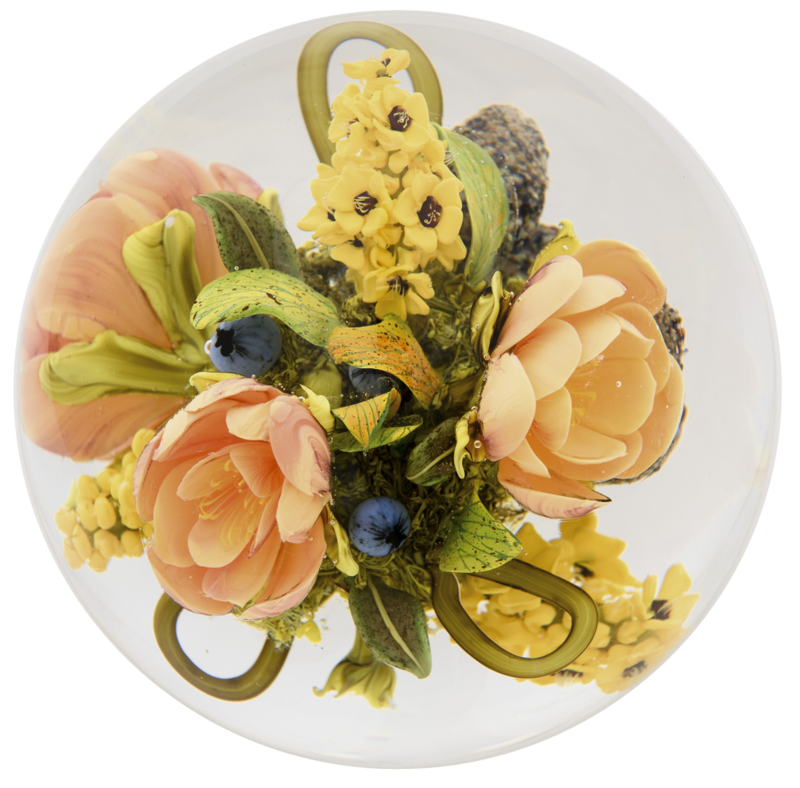 Her paperweight, Homage to Margaret Mee, was inspired by the botanical artist of the same name. Mee was a British environmentalist artist whose work is now part of the London’s Royal Botanical Gardens collection. 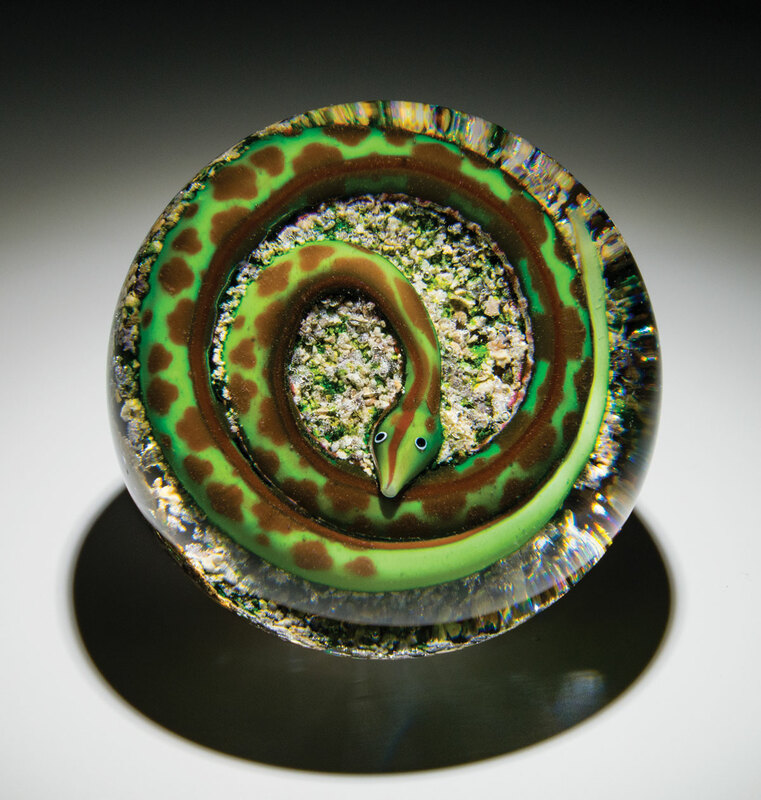 Richardson created this paperweight by lampworking the botanical creatures on the inside, and using intaglio for the accents. Intaglio is a form of design/decoration where the picture is below the surface of the glass. This effect may be achieved by cutting away the glass to form the shape of the design, or by pressing the molten glass into a mold. This exhibition catalog features more than 140 weights from the Classic Period (1845–1860) of French manufacturers Baccarat, Clichy, and Saint-Louis, to works by contemporary artists Josh Simpson and Debbie Tarsitano, from the collections of Mrs. Viola E. Bray and Mrs. Genevieve Shaw. 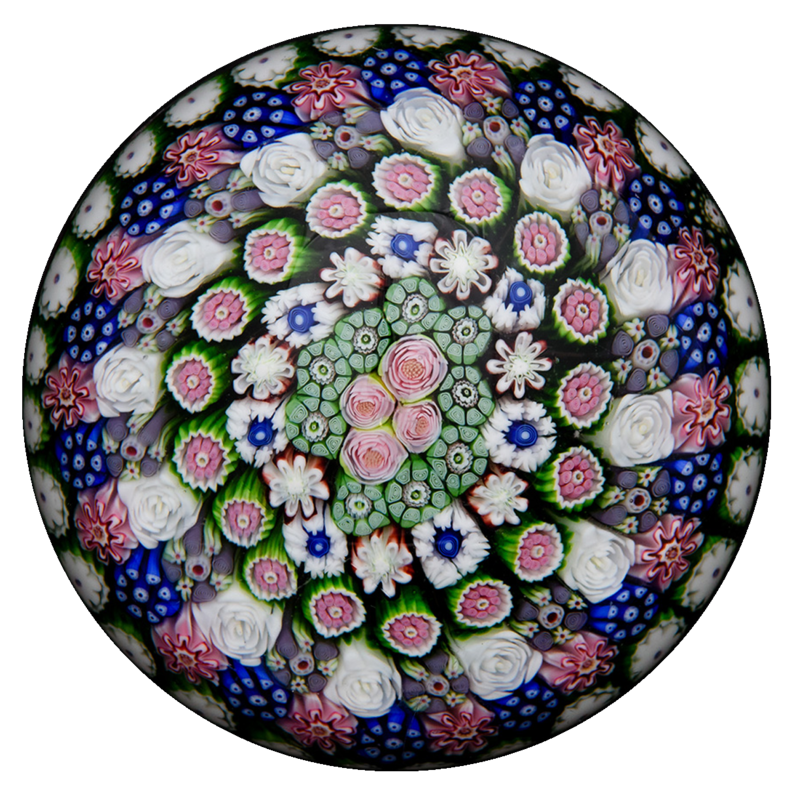 Kathryn Sharbaugh, FIA Director of Development, serves as guest curator to research and write about the history of paperweights, as well as highlight their various styles, techniques, and categories. This book is published in conjunction with the exhibition Small Worlds, which presents a survey of glass paperweights from the 19th century to the present. Support for the catalogue provided by the Bray Charitable Trust. Rick Ayotte, American, b. 1944. Terror in the Treetops, 1999. Glass. 3 x 3 3/4 inches. Collection of Gordon Park.